Also in 1909 Hornsbys received an order from the Northern Light, Power and Coal Company based at Dawson City in the Yukon. They wanted a tractor capable of shifting 100 tons, gross load, of coal over a distance of about 40 miles to the Klondyke. The vehicle was required to cross open country in the summer and snow covered terrain in the winter and, since oil was a valuable commodity in the north, whereas coal and water were plentiful, they were particularly interested in a steam powered crawler. Hornsby had not built steam engines for quite a while since they now specialised in Akroyd oil engines so they approached a neighbouring firm, William Foster & Company Ltd., of Lincoln. Fosters were also reducing their commitment to steam engines in favour of petrol driven tractors, but could still build steamers and for this unit produced a massive 80 bhp machine powered by a compound engine with cylinders of 7.75 inches and 12 inches; high pressure and low pressure respectively by 12 inch stroke. The boiler was 3 ft 3 ins diameter by 13 ft 5 ins long with a working pressure of 180psi. This was fired from a massive firebox with 10.2 sq ft grate area feeding 38, 2.75 in boiler tubes. The engine was equipped with a four-speed transmission and the differential gear included a series of dog clutches that could be used to disengage drive when the winding drum was required, or to lock the differential for straight running. The massive flywheel, which was 4 ft 6 ins diameter by 7 ins wide incorporated a friction clutch so that drive through the gears could be taken up gradually rather than by a violent jerk when it was engaged. 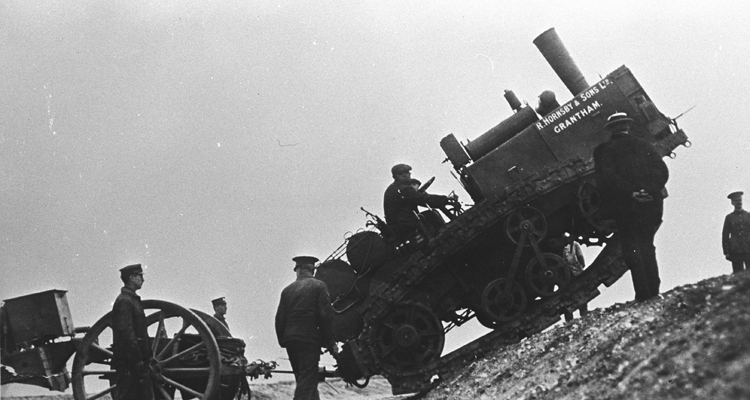 The tracks and tracked chassis were similar to, though much heavier duty than those fitted to the oil engine tractors. To begin with, when it was on trial in England the tractor ran on a pair of track rollers only but later, before it was delivered. A return roller was added to support the top run of the track linked by outside framing to the lower wheels. Since there were sprockets at both ends the final drive arrangements were probably similar to those of the Hornsby tracklayer Little Caterpillar. Since there was so little interest in tracklayers in Britain, in particular from the agricultural community which was already well established along different lines and military interest was only marginal. Hornsbys decided to sell Robert’s patents; those covering Canada and the United States were purchased by the Holt Manufacturing Company of Stockton, California although what they wanted them for is not entirely clear. Holts had been building tracklayers since about 1904 and already produced far simpler and just as robust tracks. It has been suggested that they were interested in Hornsby’s steering system although the braked differential was hardly a secret at the time and in any case Holt did not use differential gear on its tractors. When they amalgamated with C L Best in 1925 Holts called the new Company the Caterpillar Tractor Company, a name they presumably acquired from Hornsbys. One wonders if their real reason for buying up the patents was not some form of spoiling action. Did the Hornsby tracklayer lead to tanks? 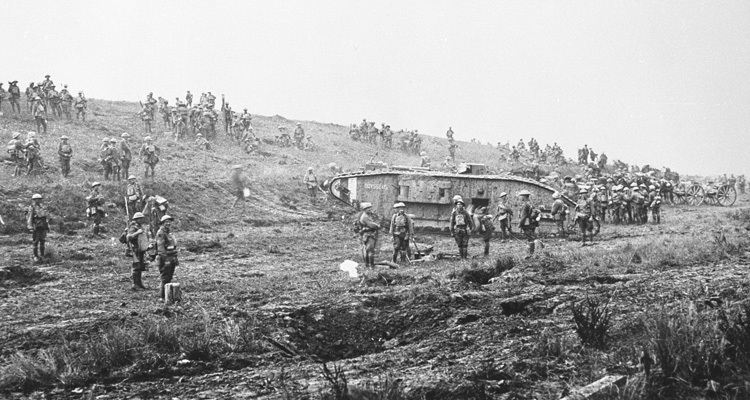 Establishing any connection between the Hornsby tracklayer and the advent of the tank in 1915 is not easy. 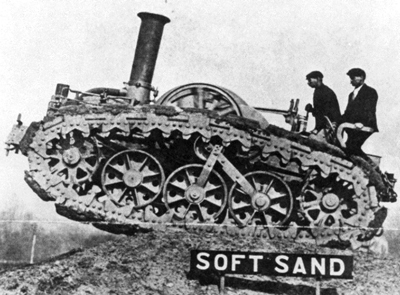 A retired Army officer, Captain Tom Tulloch, is reported to have suggested an armoured tracklaying vehicle as an antidote to the proliferation of machine guns by Germany, in 1910. 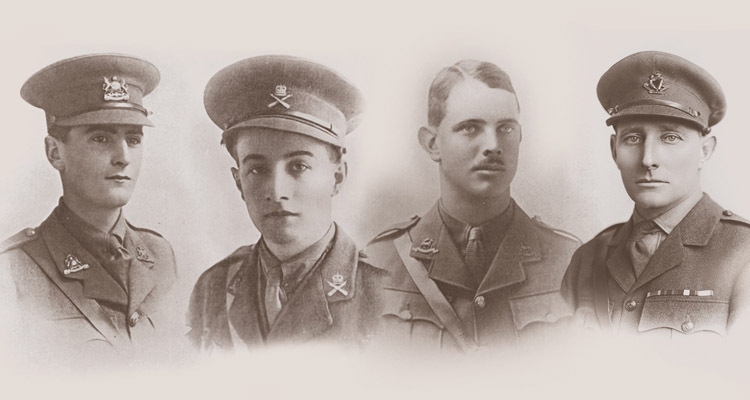 It was to consist of a pair of Hornsby tractors, arranged back to back like a Fairlie locomotive, designed to carry six 12 pounder guns, a dozen machine-guns and 100 men. He tried to get Vickers interested in the project but failed. 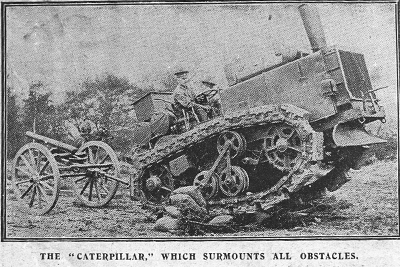 He thought it should be steam powered and armoured but that is the only mention of the Hornsby Caterpillar in connection with tanks that one is aware of. Newspaper clipping depicting a Hornsby Tracklayer. 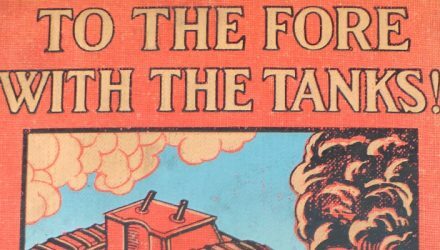 Another link, although rather an obscure one is that William Foster & Co. who built the steam units for the Yukon tractor, later, in 1915 built the prototype tank and some of the early production machines. Although again not in any way connected with Robert’s track designs. Indeed it is interesting that William Tritton, who was managing director of Fosters when the Yukon tractor was built and who played a large part in the invention of the tank while still holding that position, was dead set against tracklayers after his experience of the Hornsby tracklayer in 1909 and Foster’s own Centipede tractor of 1913. 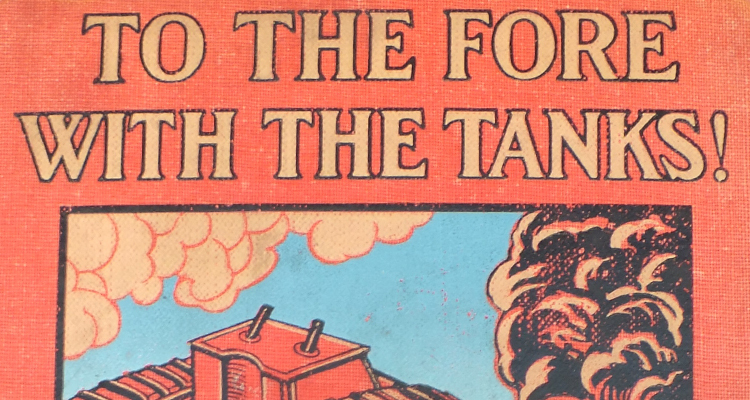 In fact the tank evolved in 1915 through Diplock’s Pedrail system and the Bullock Creeping Grip Tractor company of Chicago, neither of which had anything to do with Hornsbys at all. In the event neither the Pedrail nor Bullock systems proved to be of any use and the designers were forced to come up with a new tracklaying system of their own which also owed nothing at all to Robert’s invention. The chassis of the Yukon steam Caterpillar has been located in Canada and is in the process of being restored. 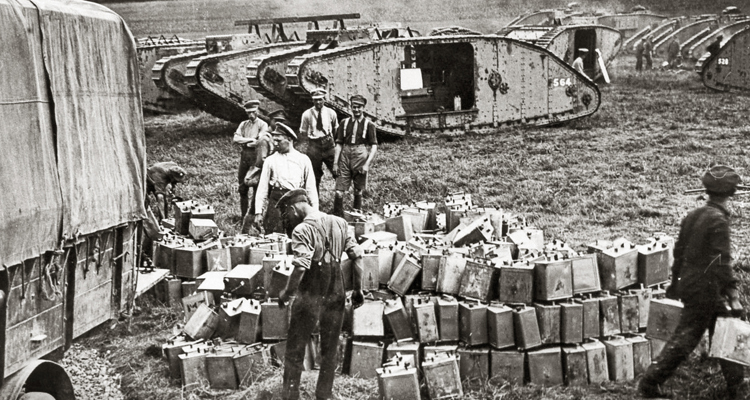 Find out more about the Hornsby tracklayer in David Fletcher’s Tank Chat.